This weekend (Nov. 22-23rd) is Oddmall in Everett, WA. 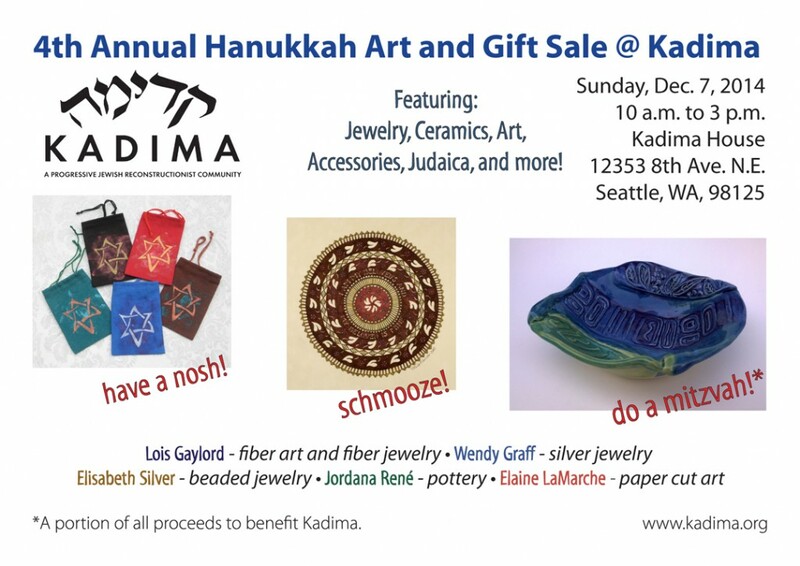 Two weeks later is the 4th annual Hanukkah Art and Gift Sale at Kadima on Dec. 7th. The following week, on Dec. 13th, I will be the speaker at the Contemporary Quilt Arts Association’s December meeting. My program is “Threads of Spirit, Cloth of Meaning”. They always welcome guests, and there is no admission fee for meetings. Scroll down for information about all of these events. Sharing a booth with Kevin Cain, should be a fun and interesting time! Saturday, Dec. 13, 2014 – 10:30 a.m. to 1:30 p.m. The Greater Seattle area is blessed this weekend, November 30 – December 2, 2012 with an amazing array of studio tours and art/craft shows and other venues. I’m posting a list of the events that I know about, and many of my artist friends will be participating in them. So, go to the shows, have fun, buy art, and support your local economy and some good causes. We all thank you, and have a wonderful holiday season, from close to 250 hard working artists. First up are the two shows I will be doing. The first is on Sunday December 2 only: The second show I will be doing is later next week. And here’s the list of some of the other shows around town. “Free, self-guided art tour of 6 home studios / galleries in North Seattle. I know eight of the 29 artists who will be selling their fabulous work. Over 30 local artists will be selling their handmade creations. 100% of proceeds from handmade wreaths, raffle baskets and other special items will benefit Soulumination and at least 25% of every purchase at the sale benefits Soulumination’s mission. Solumination celebrates the lives of children and parents facing life-threatening conditions by providing professional photgraphs of these special individuals and their families, free of charge. Urban Craft Uprising is Seattle’s largest indie craft show! At UCU, now in its eighth year, fans can choose from a wide variety of hand-crafted goods, including clothing of all types, jewelry, gifts, bags, wallets, buttons, accessories, aprons, children’s goods, toys, housewares, paper goods, candles, kits, art, food, and much, much more. Locally crafted artworks from over a dozen artists will be available to purchase through the holiday season. From pottery to painting, fiber works to jewelry, there is something for everyone at the VALA Art Shop. The Art Shop is located at Redmond Town Center on 164th St. across from Z Gallerie and next to the 164th St Starbucks. The shop will be open Friday – Sunday November 23 – December 23 from 11am-5pm during the holiday season. Stop by, buy some art and help support local artists. My friend Beth Newfeld will be here on Saturday with her fabulous felt. 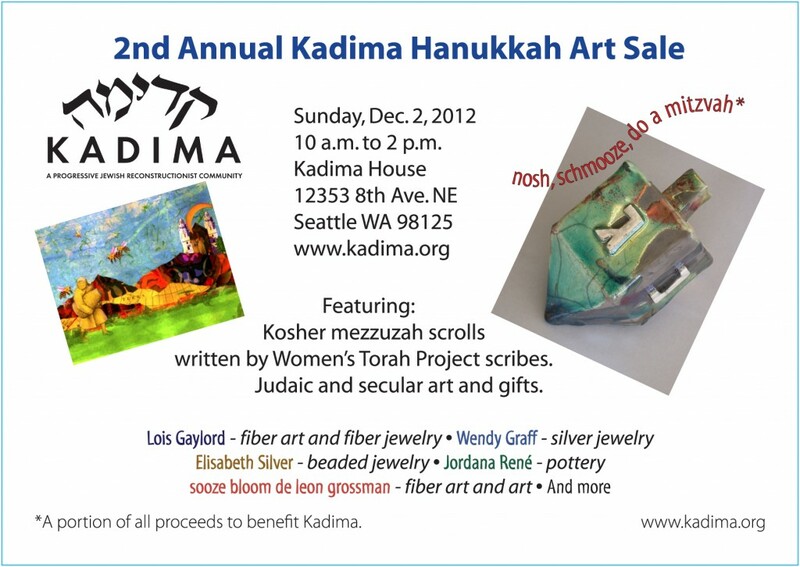 Over 20 local artists at 19720 NE 50th Street, Redmond, WA. The 29th annual Winter Studio Tour is scheduled for November 30 through December 2, 2012. We’re so excited to bring you this holiday tradition, and know you’ll enjoy meeting the artists and visiting our local artists’ studios and community halls! More than 70 artists will be on hand in ten studios. Mark your calendar now, and don’t miss it! Went and saw a really great craft show today. The Urban Craft Uprising now in it’s 8th year is having it’s summer show this weekend (July 7 & 8) at the Seattle Center Exhibition hall. Several things caught my eye and wanted to share. First of course was some fabulous yarn. For you knitters, check out Yarnarchy who has some gorgeous handspun and hand dyed yarn. And equally as gorgeous were the yarns from Spincycle yarns All handspun using a lot of “Bluefaced Leicester” a long staple fleece with high luster. The ones mixed with silk were luscious. And Yarnia from Portland was there. They will custom ply your yarn from there huge selection of fine yarns. They had cones of pre-wound yarn for sale. There were also lots of people doing upcycled crafts. Muluk does some very fun things with neckties. And Bella Sisters take old wool coats and jackets and embellish them into some very fun wearable art. Lots of wonderful jewelry, letterpress cards, pottery and more. And my one purchase was a book called Recipe for Press the diy guide for being your own publicist. The author Amy Flurry was there signing books. Had a great chat with her. Definitely glad we went today. They have a show the first weekend of December. I’m thinking about applying for it. If you can’t make it tomorrow, put it on your calendar for December 1 & 2. Peeking and slowly crawling out of the ‘spiritual closet’. Marnie Jones-Koenig on Finding Focus, Again! Lois on Peeking and slowly crawling out of the ‘spiritual closet’. Ma'ayana (Bet Cohort/RisingCircle) on Peeking and slowly crawling out of the ‘spiritual closet’.